This month Keith Robinson has found a sprawling ‘Aladdin’s Cave’ of an aviation museum behind a Norfolk pub. Near Bungay, close to the Norfolk border with Suffolk, you might come across the village of Flixton. If it’s Sunday around midday, you might even fancy stopping off for lunch at The Buck. 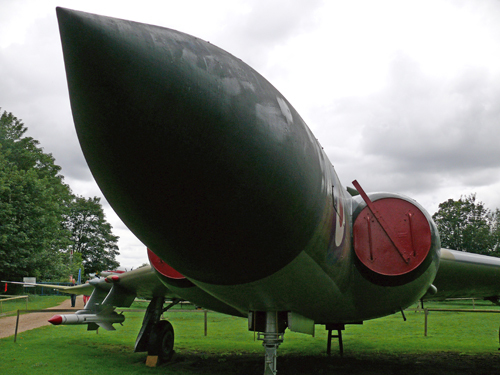 The real treat, though, whatever day of the week, is the Norfolk and Suffolk Aviation Museum – situated behind the pub. From the germ of an idea in 1972 to tell the story of aviation in the Waveney Valley, the Museum had modest beginnings in a Nissan Hut behind Flixton Post Office, at the time run by Jim Patterson, a veteran WWI pilot. It was officially opened in 1976 by Wing Commander Ken Wallis, who arrived in his self-designed autogyro – the self-same pilot noted for building and flying Little Nellie in the 1967 James Bond film You Only Live Twice. The collection soon outgrew its original home and moved to its present location when the landlord of The Buck offered two small meadows behind the pub for the Museum’s use. Today, those meadows are graced by the brilliant colours of a North American F100D Super Sabre, the livery of the USAF’s Skyblazers aerobatic team. The F100 was the world’s first operational fighter capable of level supersonic flight. 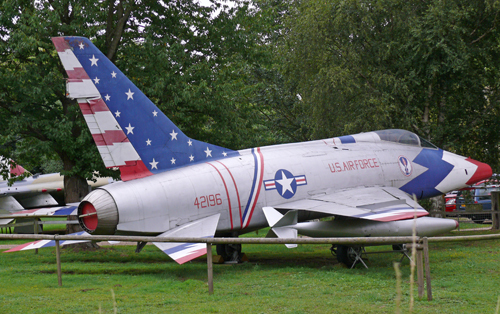 The Super Sabre shares it meadow home with, amongst others, the powerful form of a Gloster Javelin. This Javelin was initially built as the FAW.7 version, but converted to an FAW.9 (F/R), which reflected the continuing development problems with the plane’s design. Its sturdy form reveals its intended function as a robust interceptor capable of undertaking duties at night and in rough weather. With its T-shaped tail plane, the Jaguar was Britain’s only delta-wing fighter, and was capable of carrying four 230-gallon drop tanks. The example in the Museum, XH892, also took part in mid-air re-fuelling trials with the Valiant. It served several squadrons, most notably 29 Squadron when on duty in Zambia whilst the Rhodesian (now Zimbabwe) crisis was played out. Just to remind us that our subject is aviation as a whole, not just aeroplanes, there is a good example of a Westland HAR.10. This one showed its paces at the Paris Air Show in 1963, before spending most of its active life in training. It was retired in 1980 and came to Flixton the following year. Crossing a small bridge, one gets closer to the heart of the Museum. Here are the seven acres of land bought to house the ever-increasing collections. One of the first things I noticed here was the FMA IA-58 Pucarà, which is more a gnat than a bird of prey – hardly a ‘fortress’, which is the name’s meaning in Quechua. This twin turboprop was designed and built in Argentina as a light, tactical aeroplane for the nation’s Air Force, capable of flying from relatively short airstrips in counter-insurgency operations. Some 25 Pucaràs were deployed to the Falklands after the invasion in 1982. Never a match for British aircraft – though one did shoot down a Scout helicopter – all the Falklands Pucaràs were either destroyed or captured. A-528 Toto Juan is dressed in its national colours of light blue and white. Another, perhaps more striking, exhibit is an example of a Bloodhound Mk.1 Surface to Air Missile (SAM), associated here with a six-wheeled Mobile Radar Transmitter. A rather sinister combination! Work began on Mk.1 Bloodhounds in 1949 when they were one of the first anti-aircraft systems to be developed in Britain after WWII. By now it is possible to appreciate the sheer scale of the site as, looking past more aircraft, you see the Blister Hangar and the huddle of buildings which form the hub of the Museum. Standing guardian to the Blister Hangar is a Hawker Hunter FGA.9, one of myfavourite planes, and much loved and respected by the pilots who flew them. Some 2,000 Hunters were produced, with half going to overseas air-forces. When the type was retired in 1984, the airframes were quickly snapped up by foreign buyers. This one started life with 54 Squadron at Odiham in 1957 and was much travelled before retirement, ending up at Flixton in 2002. The Blister Hangar, which was put up piecemeal as finance allowed, has now been joined by several other buildings, including the 1937 Boulton and Paul hangar complex from the old Ipswich airport, a fine exhibit in itself. The phrase Aladdin’s Cave is used a lot, but Flixton truly deserves to be called this. The building complex contains not only moreplanes, but engines and ejection seats, microlights and hang gliders, models and medals, uniforms and signboards, and aviation memorabilia of all kinds. Oh! And a ‘NAAFI’ if you need a tea break. The collections consist of over 25,000 objects and only around 1% are not on display. It is crammed full of all kinds of everything aviation. The Museum is run by volunteers and, because it doesn’t charge for entry, it relies on donations to survive and thrive – often gaining grants from local councils and even the Heritage Lottery Fund for major projects. Check out the website at www.aviationmuseum.net. Even better, go visit.